Announced alongside two new cameras in the Nikon 1-Series line-up, the Nikon 1 S1 and 1 J3, these two lenses bring added versatility to the Nikon 1-Series lineup. The 6.7-13mm lens is the first ultra wide-angle lens for the Nikon 1 system. It provides the equivalent of an 18-35mm field of view in 35mm terms and has been designed for groups and landscapes and any other subject elsewhere a wide field-of-view is required. Fitting the ethos of the Nikon 1 system, the lens is small and light, but features a metallic exterior to enhance the feel and durability. Image stabilisation is not often found in wide-angle lenses as they are less prone to camera shake than telephoto lenses, but it is included here to ensure sharp shots even in low light situation where the shutter speed may drop to levels that would otherwise result in blurry images. While it won’t remove the need for a tripod, it will help and so for most shooting, your kit will be able to be kept smaller than it would otherwise need to be. A pretty good idea for such camera which are slightly limited in lowlight. The aperture mechanism is different to normal too. Instead of moving in distinct click stops, it moves smoothly from one setting to the other so you can change the aperture setting even while filming a movie, without a distracting jump in exposure. To help ensure image sharpness, the 6.7-13mm has been designed with both an aspherical element and an ED lens element. We’ll have to wait until it is in the lab though, before we know how well it performs. As a one-stop-shop lens, this new 10-100mm model from Nikon could be a very good choice. It offers a focal range that’s equivalent to 27-270mm in 35mm terms and so will cover everything from general purpose shooting, to portraits and candid photography, as well as being useful for some closer wildlife and sports events. Like the 6.7-13mm lens, this too features a Vibration Reduction (VR) function to help ensure sharp images when hand-holding. With such a long focal length available it is probably a setting best left on all the time. In the quest for high image quality, the 10-100mm lens features an aspherical and an ED glass element, said to improve both contrast and resolution. How it performs in the tests though will largely be controlled by the focal range on offer – usually the longer the focal range, the more compromises have to be made in the optical design. This is especially true of compact lenses. As with the 6.7-13mm lens, this model also features a smooth aperture mechanism to allow gradual changes in aperture while filming. 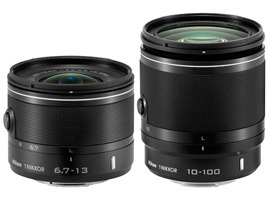 Both lenses are expected to be available in February 2013. The 1 NIKKOR 6.7-13mm f/3.5-5.6 will retail at an SRP of $499.95 USD while the 1 NIKKOR 10-100mm f4-5.6 has an SRP of $549.95 USD.